A storm’s a-brewin’ here in the DC area as we await Hurricane Irene. It’s been a weird week here, what with the big earthquake and all. These forces of nature formed the backdrop of a lovely evening of theater last night in Olney, Maryland. The National Players presented a free outdoor Summer Shakespeare show, The Taming of the Shrew, at the Olney Theatre Center. Director Clay Hopper set the stage by first checking the hurricane app on his iPhone… “It’s not here yet!” he announced as he looked up at the lovely evening sky. Then he noted that we were in the safest theater around in case of another earthquake (outside, backed by some woods and serenaded by cicadas). With that, the show began, and what fun! They jumped right in with a rowdy wild West theme that worked well for me. Very stylized acting/fighting and lots of funny sound effects brought out the farce of the play. Bianca was literally all white from head (very blond hair) to toe (dressed in sparkly white). No-nonsense Kate, in leggings and corset, played the part well — athletically taking on Petruchio and even cartwheeling away from him… a force of nature, indeed! The staging was great fun and judging from all the laughter, a big hit with the audience. 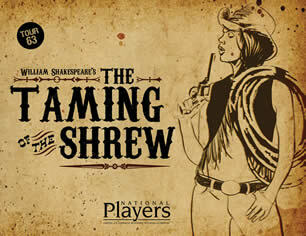 The National Players are in their 63rd year and presenting their 22nd free Summer Shakespeare production. The show is supposed to continue tonight in Olney, but I have a feeling that Hopper’s hurricane app may sing a different tune than last night. My trees are already a-blowin’ here in Gaithersburg.